GOOD GOD MAN, RUN. RUN QUICKLY! SAVE YOURSELVES, THERE'S A VICIOUS BEAST PROWLING. CALL THE POLICE! CALL THE ZOO! CALL—Wait, what? What'd you say? It's just a stupid stuffed animal? Aw crap. If that's how you would've reacted to the sight of that big ol' stuffed kitty up there, congratulations! 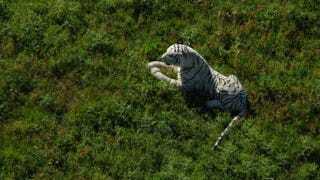 You share much in common with the could people of Hampshire, UK, whose police force scrambled a helicopter with thermal imaging cameras and a tranquilizer team from the local zoo when the big cat was discovered near a cricket ground and golf course. Tony Middleton, Hampshire Cricket Academy director, added: "Rumours came round that there was a tiger on the golf course and we just carried on playing until a policeman came over and told us to clear the area. "I assumed there was [a tiger] with everything that was going on, but we felt quite safe here."